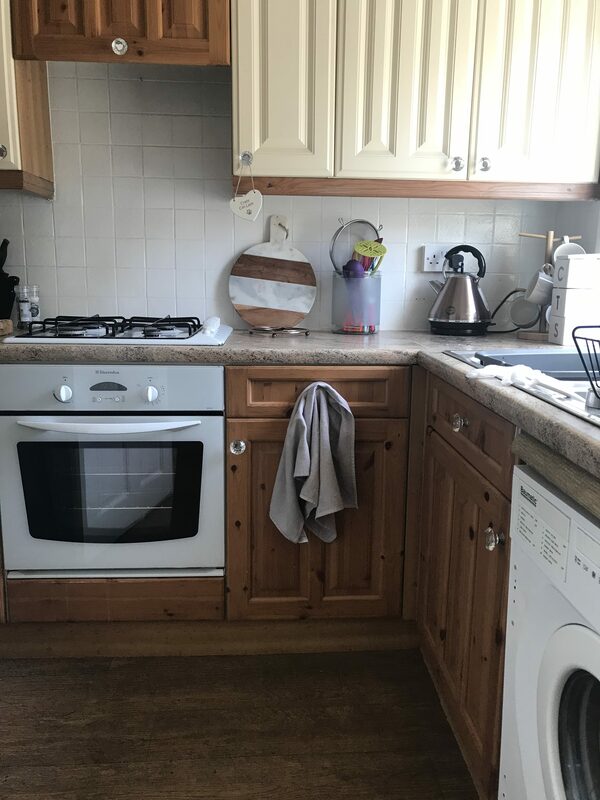 The room I hated the most when I moved into my new home was the kitchen, it was so far away from my style and I just didn’t want to spend any time in there. It was dull, dingey and in desperate need of a makeover. The kitchen, as were all rooms in the house, were very clearly done on a budget – everything was falling apart and a lot of corners were cut. The door to the cellar was falling off and the wallpaper was greasy and falling off. I had a few different ideas when I started to plan the look of the new kitchen, but ultimately I wanted it to be bright and functional. I had toyed with the idea of a dark kitchen and open shelving but I needed to be able to use the space properly and feel comfortable in it – I have a lot of stuff and having open shelving piled with glasses and plates in such a small space just wouldn’t be right. 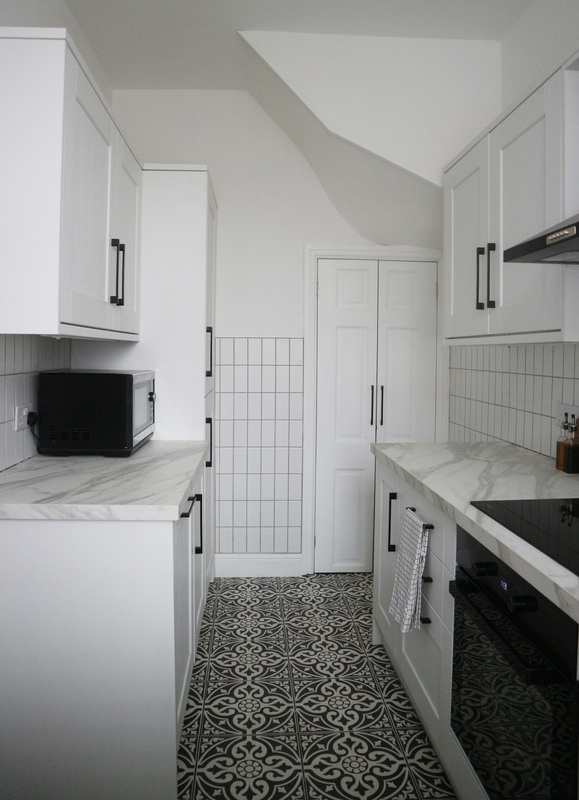 I decided I needed a lighter colour but there wasn’t really that many options when I was researching – there was a lot of grey, but I’m not a huge fan of grey anymore – a kitchen is a big expense when renovating so I knew I couldn’t be trend driven. 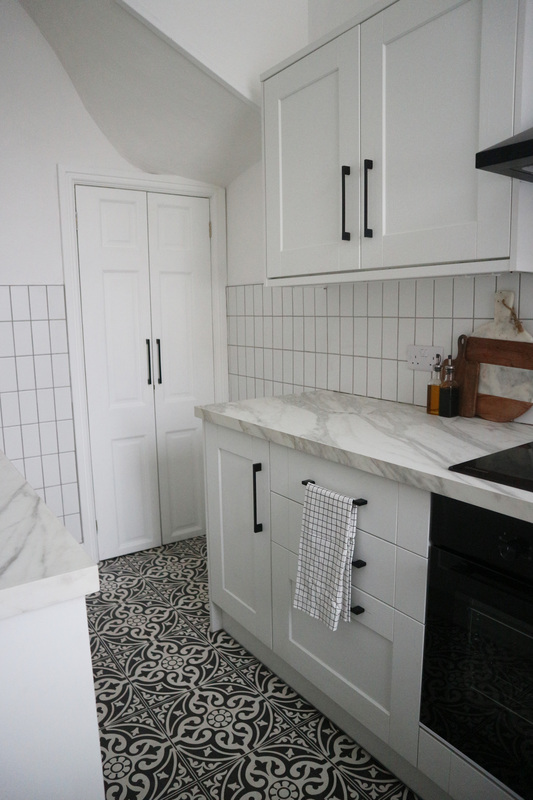 I wanted a Shaker style kitchen, they’re really popular at the moment, but have been for many many years so I knew it would stand the test of time. 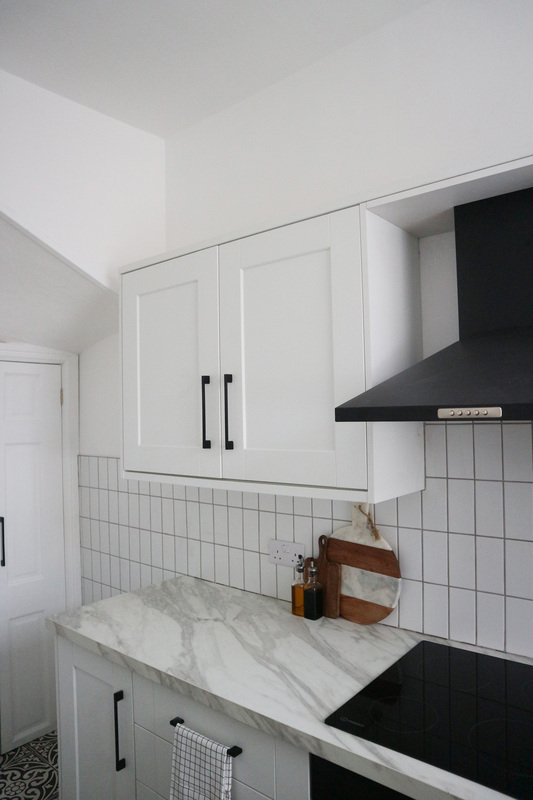 I had white gloss doors in my old kitchen and knew I didn’t want that again as I thought it looked a bit too ‘basic’ and budget – which it was! After a lot of research and sleepless nights (I’m a worrier now apparently!) 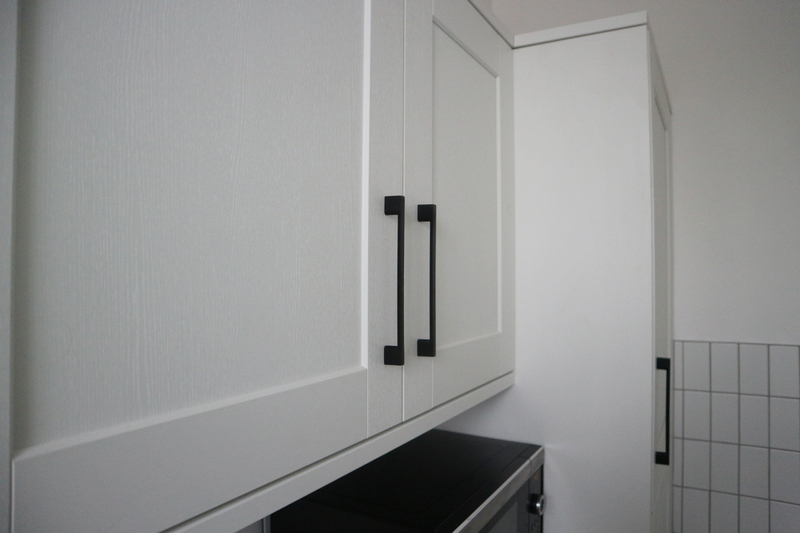 – I decided to go for the Fairford Shaker from Howdens in White but I knew I wanted to add a modern edge so along with the rest of the doors in my house, I opted for black handles to add a real contrast to the space. I went for these from Ironmongery Direct and really couldn’t recommend them enough, they were 1/3 of the price of the ones that Howdens quoted and these are slimmer so a lot less blocky. 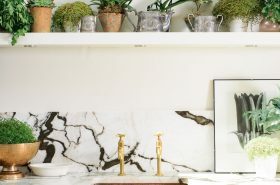 The worktop is also from Howdens, but I’m not sure exactly what the name of it is, but it’s laminate marble effect. 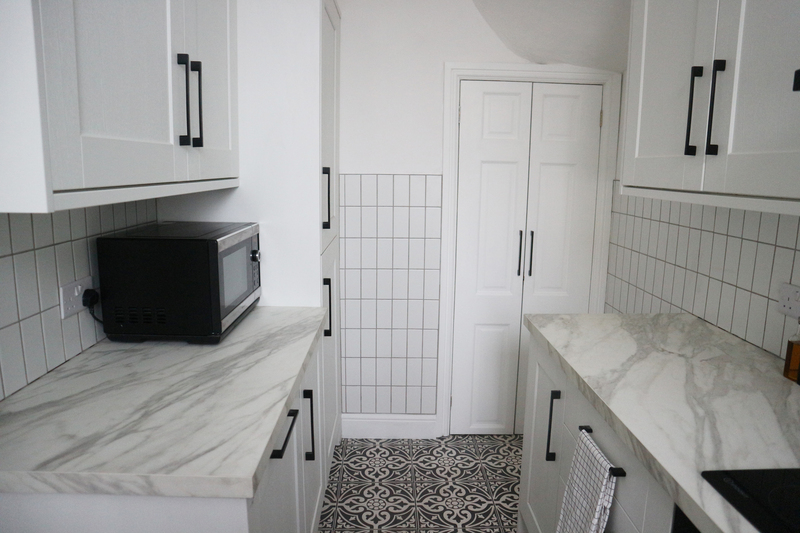 The wall tile pattern was a spur of the moment decision when the way I wanted originally (herringbone) wasn’t working how we expected – but I’d seen a few photos on pinterest and knew that it would look just as good. The tiles are from Walls & Floors, they’re a matt finish and have flat edges so are a bit more modern than standard metro tiles. I’m not a lover of glossy finishes, so these were perfect and not a bad price! We went for a light grey grout instead of black/dark grey to soften it all up a bit. In my opinion, the flooring is the real showstopper of the room. It was a very kind gift from the wonderful people at British Ceramic Tile. 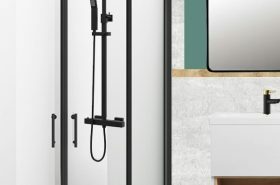 Their website was the first place I went when I started looking for floor tiles, they have huge ranges of innovative ceramic, porcelain and glass tiles, ideal for both floors and walls. If you’re decorating your bathroom, kitchen, indoor and outdoor spaces, definitely check out British Ceramic Tile. I went for the Devonstone in Black Satin and I can’t get over how perfect they are for the room. The day the flooring went down was the day it all started to feel real – it brought together all of the other elements and made the whole space come alive. All of their products are amazing quality, I have boxes and boxes of samples from when I was deciding on a style and can confirm they’re all beautiful. I decided to go for the Devonstone style as I’m trying to bring in more Victorian elements through the renovation as there aren’t really any original features in the house and I think it deserves a bit of charm adding back in. They’ve been going for over 100 years so they definitely know how to make brilliant quality tiles. They also have some amazing collections with iconic British brands such as Ted Baker, V&A, Laura Ashley and Studio Conran. They are also offering you lot 10% off all orders – excluding sample orders with the code: ZOE10 – happy tile shopping! We replaced the awful concertina ‘door’ to the cellar (look at the second photo in the ‘before’ section) with a solid door. It was my idea to cut it in half so that it didn’t take up loads of unnecessary room and which also meant that I could increase the length of the run of units on the back wall a bit more for added storage. We added the same handles as on the units to bring it all together. I decided to go for black appliances to further intensify the ‘monochrome’ look. Most of the appliances were from AO, solely down to the range of products they offer and the ability to deliver next day – something which was quite important as I didn’t want my living room full of appliances for ages while they were waiting to be fitted. I didn’t want that, but that’s exactly what happened as my Dad came down with really bad food poisoning the day the appliances arrived – not great timing but we were more focused on getting him better than the giant boxes taking over my living room. We also had an accident that same day while the hob was being fitted. It was upside down on the worktop while all the wires being connected and my Dad got side-tracked and went to go do something else, not realising the hob and all of it’s rings were on… yeah you can probably guess what happened. 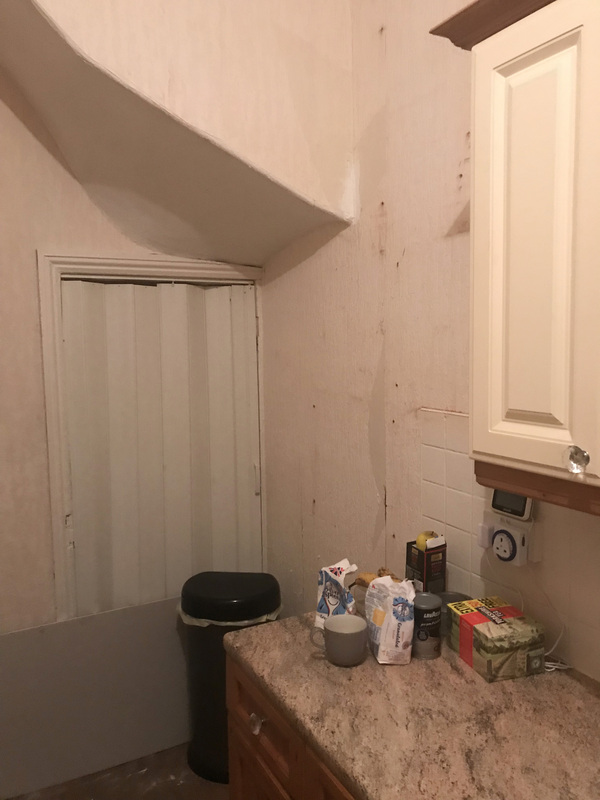 It set the cardboard on top of the worktop on fire and subsequently burnt and ruined the worktop… luckily that was the only damage – the units, the rest of the kitchen and more importantly, we were all ok – thankfully! 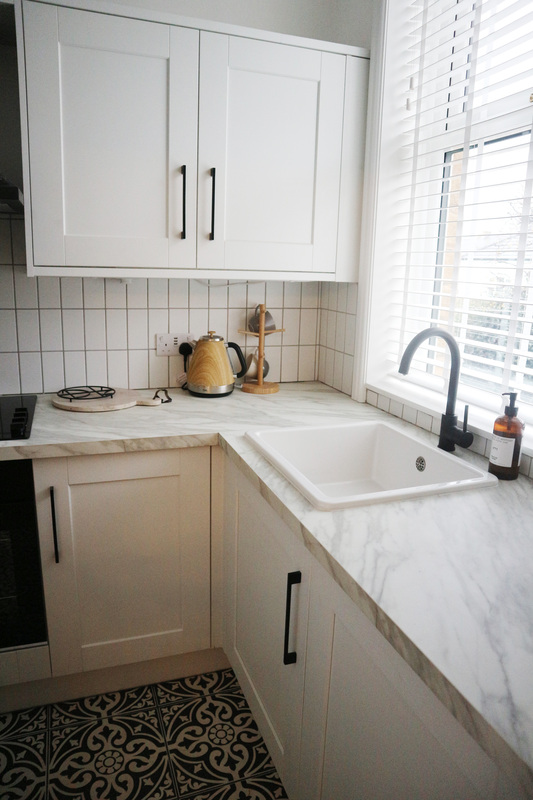 I desperately wanted a belfast sink but with laminate worktops, it’s not really possible to get an under-mounted sink so I went for this beautiful ceramic one from IKEA. Again with the monochrome theme, I went for a black tap from Cooke & Lewis which was only £47, so an absolute bargain compared to some of the others I was looking at! So what do you think of my kitchen makeover? It’s completely changed the feel of the room and I’m so pleased with the final result! This post contains affiliate links – if you choose to buy from any of the links above, I may make a small commission. Your kitchen looks incredible! It looks so much bigger with the lighter colors. Thank you, it really does, doesn’t it? Oh my god look this looks AMAZING!! This is giving me so much inspiration for the future – you have made a relatively small space look infinitely bigger! LOVE the tiles too! Your blog is my dream to be fair…!